Have you all seen that new Subway commercial about the Pastrami sandwich? Well, the commercial is kinda stupid, but I can understand the love for the meat. Probably one of my favorite sandwiches that I rarely think to eat is pastrami on dark rye bread with spicy mustard. Sweet baby Jesus. I thought about the dark rye a little too late this time around (a future post, perhaps?? 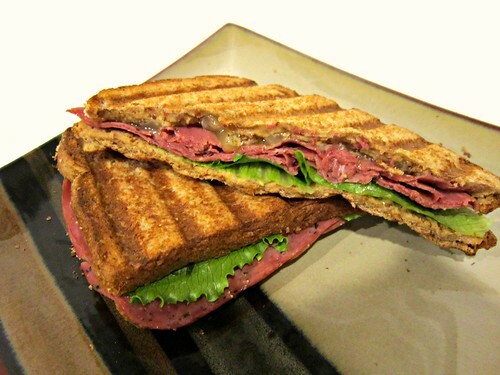 ), but got creative with what I had on hand for a brand new (to me, at least) sammich combo…pastrami & brie! I think Swiss cheese is the most commonly used, but I knew I had some brie at home that needed to be used up and figured, why not? I added a leaf of lettuce after it was done to round it out and it turned out to be a damn good little panini, if I do say so myself! Don’t believe me (or even if you do!) try it for yourself!! Preheat panini press or griddle over medium-high heat. Spread 1 teaspoon of mustard onto two of the slices of bread. Top with about 4 slices of brie, then about 5 slices of pastrami, and the other slices of bread. Place in the panini press and lock the lid down (or place on griddle with a heavy plate on top to hold it in place) and cook for about 2 minutes. Check to see if brie is melty and either remove or cook for an additional minute. Remove from heat, remove the slice of bread not touching the brie and add a lettuce leave to each panini. Replace the piece of bread, slice in half diagonally, and enjoy!